Normally, when thinking of rebadge operation between Fiat and Chrysler, people think of Chrysler products using Fiat logos. The Dodge Journey became the Fiat Freemont in Europe and Brazil, the Chrysler 300 is known as the Lancia Thema in Europe, the Chrysler Town & Country is the Lancia Voyager, and lately the Chrysler 200 Cabrio is available in Europe as the Lancia Flavia. But Chrysler is doing the same and it has just presented the new Dodge Forza for Venezuelan market, based on the old Fiat Siena. As it happened with the Freemont, and the American Lancias, the Forza is exactly the same Siena, without any particular change, except for the logo. Chrysler is well-known in this South American country thanks to its local assembly plant that is one of the country’s most dynamic. In the last months, Chrysler stopped the production of the Dodge Caliber so it run out of a passenger car for this brand. They decided to take the od generation Siena and build it locally to meet the requirements of a market extremely controlled by the socialist government. Venezuelan car market dropped from almost 500.000 units some years ago to 100.000 last year. Government restrictions to exchange market, and the deterioration of life standards of the majority of the population have contributed to this bad situation. This is not the first time the Siena is assembled in Venezuela: Fiat used to make it, along with the Palio, from 1997 up to 2001, when the brand, which had a good market share, closed its plant to concentrate all production in Brazil and Argentina. Chrysler de Venezuela invested $44 million to adapt its assembly plant. The Forza is the first hybrid car produced locally, as it incorporates both, petrol and gas engines. It has a petrol tank for 48 liters, and 2 gas cylinders. Its petrol engine is powered by 1.4 Fire with 79 hp. 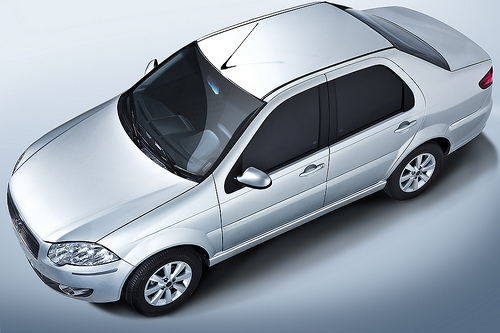 The introduction of this model was already anticipated by Fiat Group’s World in September 2012. At least change the grille, and DODGE has more reputation in Sotuh America than FIAT. Bring back Dodge. Fiat just rebadged the Siena as a Dodge because another company, Comercializadora Todeschini, was granted all the rights to sell Fiat-branded cars in Venezuela. By the way, since the Dodge Forza is based in a version of the Siena targeted to the taxi segment in Brazil, it’s factory-fitted with a dual-fuel system, for both gasoline and CNG, enabling FCA to comply to that decree issued in 2009 by the then-dictator Hugo Rafael Chávez Frías that stipulated a minimum quota of 50% of all the new cars sold by manufacturers or importers to have the ability to run on Natural Gas.